Andamans or Kala Paani (Black Water)! For centuries, Andamans has been nick named as Kala Paani. So much so that people in the mainland often relate it to a punishment center (details are furnished later on the page). But truly, Andamans is much more than simply a cellular jail and sea beaches. The Islands are located in the Bay of Bengal at a distance of more than 1200 Kms from the mainland. This Union Territory is stretched over an area of more than 700 Km. from north to south with 36 inhabited islands and is divided into two districts – Andaman to the North and Nicobar to the South. The two are separated by about 90 nm of sea – The Ten degrees Channel. These islands are the continuation of the Arakan Yoma mountain range which extends from Myanmar upto Achin Head of Indonesia. 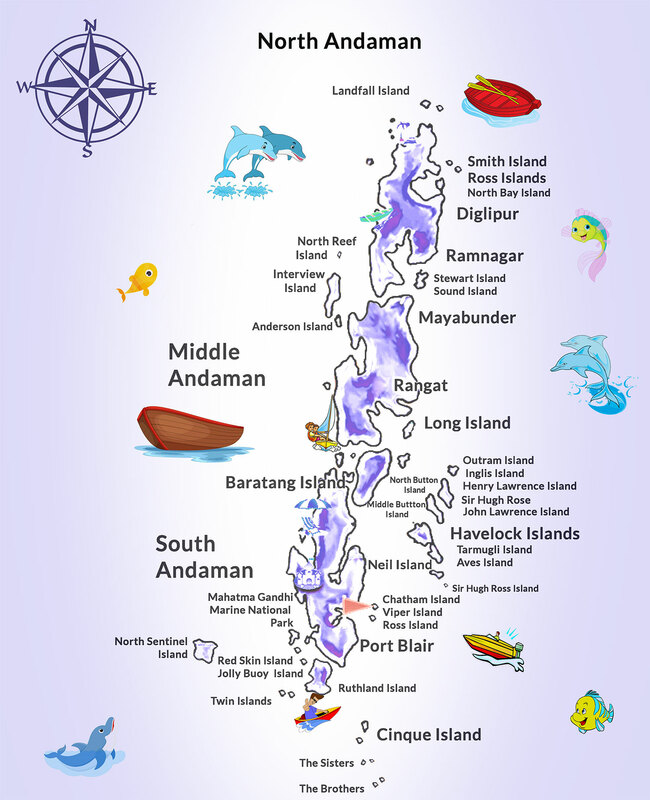 Andaman and Nicobar Islands comprise of 572 islands of which 32 are inhabited. Earlier, pre-Tsunami, 38 of them were inhabited but after the Tsunami, two islands viz., Trinket and Bambuka were evacuated. The islands have a coverage of evergreen tropical rain forests upto 86%! The modern history of Andaman and Nicobar Islands begins with the bringing of 200 mutineers of 1857 in January, 1958. The construction of the Cellular Jail (present National Memorial) began in 1896 and was completed in 1906. In the year 1789, they first discovered the Andaman and Nicobar Islands. But due to the natural calamities, they left the island by 1796. The second settlement was basically a penal settlement, taken up in 1858, after the First War of Independence, followed by the settlement of convicts, Moplas, some criminal tribes from Central and United Provinces, refugees from erstwhile East Pakistan, Burma and Sri Lanka as well as ex-servicemen. It was in 1857, after India’s First War of Independence, that a penal colony was attempted at Port Blair with an initial lot of 200 freedom fighter who, for the first time, attempted to over throw British rule in India. The number of freedom fighters increased to 773 within three months. During 1869 – 70 many Wahabi Movement activists who rose against the British rule were deported from the Central and United Provinces of undivided India to Andaman. One amongst them was Mohd. Sher Ali Khan (a Pathan),who assassinated Lord Mayo, the Viceroy and Governor General of India on 08 February 1872 at Hope Town Jetty (now called Panighat). Later,in the same year, Sher Ali Khan was executed in Viper Island by the British. On 13 September 1893, the British Government of India, ordered the construction of a cellular jail to accommodate 600 prisoners. Prior to construction of the Cellular Jail, male convicts were held in a jail on Viper Island and women convicts in South point barracks (near the present day hotel Sinclair). During the 2nd World War the British hastily evacuated and abandoned these Islands in the face of advancing Japanese Forces, allowing Japanese occupation of Andaman and Nicobar Islands. The Japanese brutally ruled the territory for four years from 1942 to 1945. During this period, Japanese took up massive fortification on these islands through construction of airfields (Port Blair, Rutland, Car Nicobar), installation of Radars and guns for air defense network, chain of foreshore concrete pill boxes. On the morning of 7th October 1945, the Armada carrying 116 Indian infantry brigade of South East Asian allied Land force under the command of Brigadier A.J. Solomon surrounded Port Blair Compelling about 20,000 armed Japanese force to surrender on 9th October 1945. With the advent of Indian Independence on 15th August 1947, these islands were merged with the Indian main stream. There are five indigenous tribes of Andaman and Nicobar Islands. Mythologicaly, the name Andaman was presumed to be derived from Hanuman, who was known to the Malays as Handuman. The name Nicobar seems to be a corruption of the South Indian term ‘Nakkavaram’ (Land of the Naked) as indicated in the great Tanjore inscription of AD 1050. No one has been able to answer the question, with any degree of accuracy as to how and when the primitive tribal groups came to Andamans. The study of kitchen-midden of the Andamanese settlements revealed that the Negritos were present at least 2000 years ago in the Great Andamans (Large main islands apart from North Sentinel Island and Little Andaman). For quite some time it was believed that the aborigines of the Andaman Islands were descendants of African slaves once shipwrecked while being carried on board a Portuguese ship. But most of the anthropologists have come to the firm conclusion that they are not Negros but Negritos. In 1952, Lidio Cipriani, an Italian anthropologist dug up a kitchen-midden in Goalpahal in Little Andaman Island. While digging he reached depth of about 4 Mtrs, from the top of the midden through refuse mixed with only a little earth, very easy to penetrate. Bones, shells and other objects emerged clean as if only recently rejected. The situation altered suddenly about one meter from the bottom, when the strata became hard and cemented with a mixture of ashes and earth. In this layer, the shells were calcified by exposure to fire, and so fragile they could only be recovered in broken pieces. This means that when they arrived, the Negrito has no pottery. Among the Andamanese tribes, Jarawa community had arrived after the Great Andamanese in these islands. This conclusion can be made from the fact that the word Jarawa has been derived from the Great Andamanese Language which means ‘stranger’. Normally, annual rainfall in Port Blair is more than 300 mm. The temperature varies from 23 C to 25 C from time to time and depending upon the location. The relative humidity is usually about 78%. There is a preponderance of evergreen trees in the Andaman forests but they are generally heavily laden by climbers. Glades of bamboo can be found in the forests. First class Padauk, Koko, Chuglum, Marble and satin wood are available. Coastal ecosystem in the Islands is being maintained by Mangrove forests. With coastline of about 2000 Kms, an Exclusive Economic Zone (EEZ) consisting of 6 lakh sq km of marine water and some of India’s richest rain forests, the Islands are the repository of immense variety of ecosystem and wildlife. An estimated figure of 2200 flowering plants and 120 firns, 58 mammals, 242 birds, 83 reptiles, 10 amphibians 750 fish, 320 coelenterates (Corals, sponges, anemoner, jelly fish etc), 407 crustaceans (crabs, lobsters, shrimps, barnacles etc), 1500 insects is believed to be surviving in Andamans. So far, 179 species of corals belonging to 61 generea have been reported. A number of species found here are endangered species – Andaman wild pig, Dugong, Elephant, Salt Water Crocodile, Turtles, Python, Andaman teal, Hornbill Nicobar Pigeon and White Bellied Sea Eagle etc. Animals such as Crocodiles, Monitor Lizard, snakes are a common sight throughout the Islands. Though, sadly their number is reducing very fast. Dugong (Sea Cow) has been named as the national animal of Andaman and Nicobar Islands.